A crash course in the 2017 tank reworks. Riot’s midseason class updates set out to sharpen each role's distinct identity, and this was especially the case for tanks. Initiating teamfights and protecting squishy carries is a responsibility many tanks share and mastering the role will help increase your chances of grabbing a win at City Champs, where you can represent your city in live matches against rivals from around the country. So how can you use the 2017 tank changes at City Champs? Tanks have seen an increase in popularity thanks to the midseason patch and subsequent item and champion changes. Their strong late-game and safe playstyle continue to make tanks a staple pick in competitive play, with champions like Zac and Maokai being popular this meta. Without tanks, most teams quickly fall apart in the mid-game, due to having no CC or huge pools of health to soak up damage during engages. Tanks constantly stick to their targets and block incoming damage that would prove fatal to squishy carries, while also building items that help support their teammates. A good tank will lock down enemies with hard CC and cripple their mobility and attacking functionalities, while giving their carries enough time to lay down their damage and pick up kills. The 2017 tank reworks saw the introduction of durability items, which gave tanks extra toughness to survive teamfights. Meanwhile, the introduction of Gargoyle Stoneplate has given tanks increased hybrid armor/magic resist that grants bonus health at the expense of damage dealt. When you’re surrounded by three or more enemy champions, Stoneplate really shines, as it’ll grant you even more armor and magic resist, and the active’s bonus health will scale even further. This item works extremely well against high-damage ADCs like Twitch and Caitlyn, while also nullifying the burst from popular AP casters. The giant health numbers of the reworked defensive items means tanks now spike harder off their first big purchase, which often makes it difficult for damage dealers to keep up with them. Meanwhile, resistance and health items like Spirit Visage, Sunfire Cape, Dead Man’s Plate and Randuin’s Omen offer effective ways of countering various damage types. Just make sure you take a look at the enemy team and build resistance around the main damage dealers. However, health stacking has now become increasingly popular for those looking to become unkillable in the late-game. Try building Locket of the Iron Solari and Gargoyle Stoneplate to give your squishy carries a shield that doubles their health. Meanwhile, the 7.14 patch has brought updates to Thornmail to help tanks counter teams with heavy AD and lifesteal. While mages have Morellonomicon and other carries have Executioner’s Calling to help focus down healing-oriented threats, Thornmail ensures melee champs can at least force high-sustain damage dealers to look elsewhere for their healing, as opposed to abusing their large health pool. Thornmail now provides health and applies grievous wounds to attackers, which has led to picks like Rammus becoming incredibly popular in Korean solo queue. When you combine the grievous wounds from Thornmail and the magic damage from Cinderhulk you have a tank that can dish out lots of reflection damage, as well as being incredibly hard to shut down. If you use these new items at City Champs, you’ll be well on your way to climbing the ranks for your region. Zac is one of the most unique and rewarding tanks to play and his midseason rework has led to him being incredibly popular in the competitive scene. His Elastic Slingshot allows Zac to engage from great distances and unexpected angles, while Cell Division’s blob pickups give him decent amounts of combat regen. However, his two new forms of CC have helped the Experiment of Zaun climb even further. Stretching Strikes now throws out a blob hand that sticks onto the first enemy Zac hits. Once he latches onto something, his next basic attack is replaced by another Stretching Strike, and he’ll use his gooey appendages to slam both targets into each other. Meanwhile, Let’s Bounce now allows Zac to scoop up every enemy and carry them over to a target location. If you’re looking for a tank that combines high doses of chain CC with decent damage, Zac is the champion for you. The midseason rework and consequent tank item updates have led to Sejuani’s increased popularity. The Fury of the North currently has the third highest winrate (53.02%) in Korean solo queue, as players have been using her barrage of CC to deliver critical blows to teams in ranked play. Her Permafrost comprises the bulk of Sejuani’s power and unlike Braum’s passive, Sejuani doesn’t need to be the one to start the stacking. Once a target’s reached max stacks, Sejuani can simply stun them with Permafrost. If she attacks a frozen target, she’ll shatter the ice for major damage. 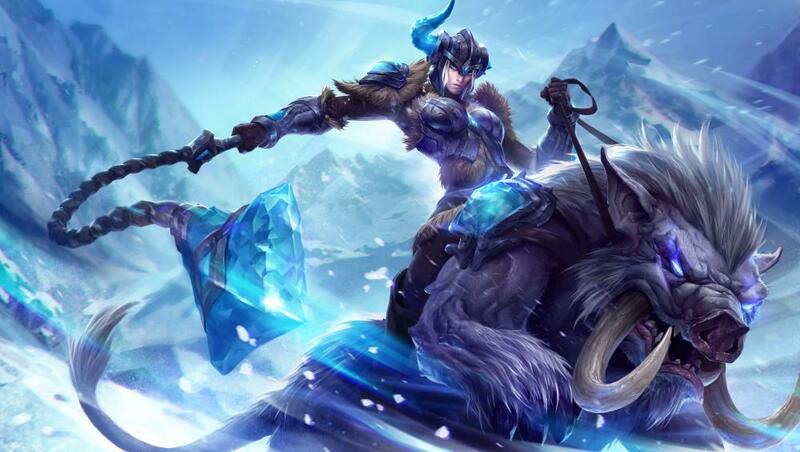 Because of this, Sejuani is at her strongest in 2v2 or 3v3 situations where she can leap into the action and Permafrost every enemy encountered. Meanwhile, her tankiness from Frost Armor gives her survivability to charge into the fray and unleash a volley of icy slows and knock-ups from Winter’s Wrath and Glacial Prison. Maokai has been incredibly popular since the start of the season and many pro teams continue to utilise the Rift’s sentient tree to devastating effect. His Saplings now deal more damage when tossed into a brush, adding increased strategic value as little sentries and adding a deadly surprise to anyone who walks near. Sap Magic now operates off a cooldown, and keeps him healthy when using abilities or being hit by an enemy. This makes him extremely resilient against popular AP mid-laners like Kassadin and Orianna and gives him added survivability when ganking and teamfighting. However, the biggest change is to Nature’s Grasp, which has been completely redesigned. His ultimate summons a lane-wide wall of roots that slowly advances forward, with each one rooting the first enemy champion hit. This wall of roots is absolutely devastating in teamfights, but requires you to plan ahead to utilise its full potential. If you want to use nature to do your bidding then give the Twisted Treant a go at City Champs. Head over to the Super League LoL events page where you can purchase your Online Qualifier ticket. Once you’ve purchased your City Champs ticket, you will be placed in one of the four tiers based on your personal solo queue ranking. However, only the top players will have a chance to represent their city, so make sure you play at your best during the six qualifying matches. However, don’t be disheartened if you don’t make the cut, as you’ll be able to play Challenge Matches as reinforcement to help earn points for your city. If you want to play against the best players in your region make sure you sign up for City Champs today.